There’s a new voice of Pigeon - mine. This is definitely a temporary solution. I’m looking to record in better quality with some voice talent soon. Let me know if you have any problems or can’t understand anything. The next generation of Africans are more mobile literate than you (or me), so when you develop something make sure you keep it open enough for them to evolve its use. Develop for the common denominator - that is SMS services only. If you have the time, and see a need later, then go for the fancy Java apps. Data services, like SMS are a good starting point, but don’t overlook the use and integration of voice. This is especially relevant in areas where local language dialects and literacy are an issue. If you can, provide a basic service, and let the local users develop a plan for how to use it in their area. 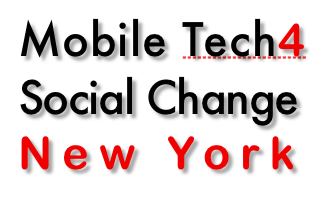 MobileActive.org and Hunter College’s Integrated Media Arts Program are hosting Mobile Tech 4 Social Change - New York, a BarCamp, on Feburary 21. I’ll be attending. Anyone want to join?